With a chance of the MSU venue service time, we are now waiting until Sunday after the 11:30 service to prep the message video for that venue. 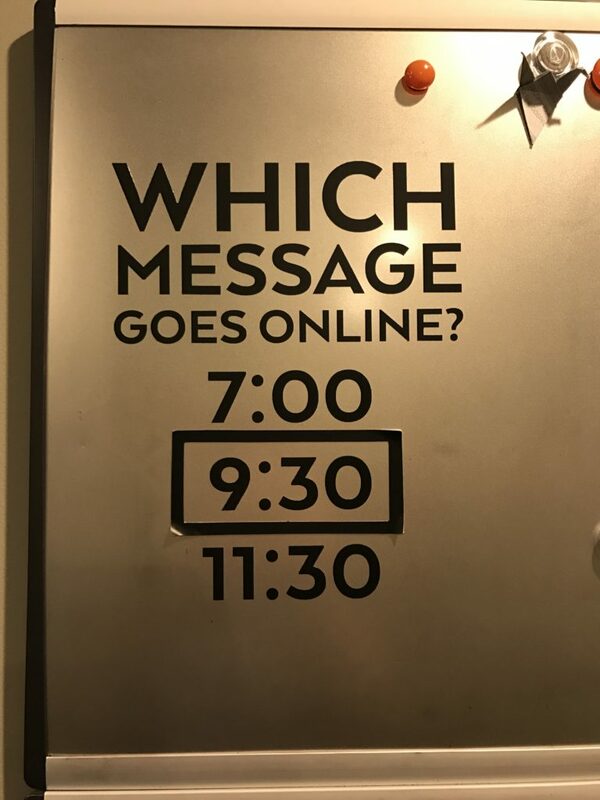 Here are a few short steps to make sure they are all set for services on Sunday night. 1. Turn on the MSU Message MacBook. 2. 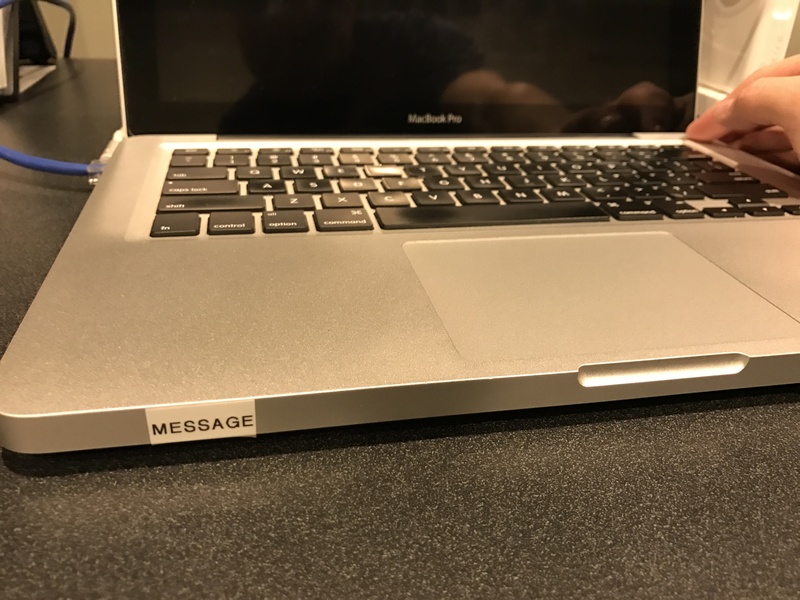 On the MSU MacBook desktop, double click the Mount Message Video icon. 3. Drag the three message video files (bktchvid.mp4, Untitled 01.mp4, Untitled 02.mp4) from the window that pops up to the Video Backup folder. Click Apply to All, and then Replace on the dialog box that pops up. This should start the copy process, which takes about 5 minutes. 4. When the 3 video files (bktchvid.mp4, Untitled 01.mp4, Untitled 02.mp4) finish coping on the MSU Background Macbook, click the Apple icon and Shut Down the computer. 5. 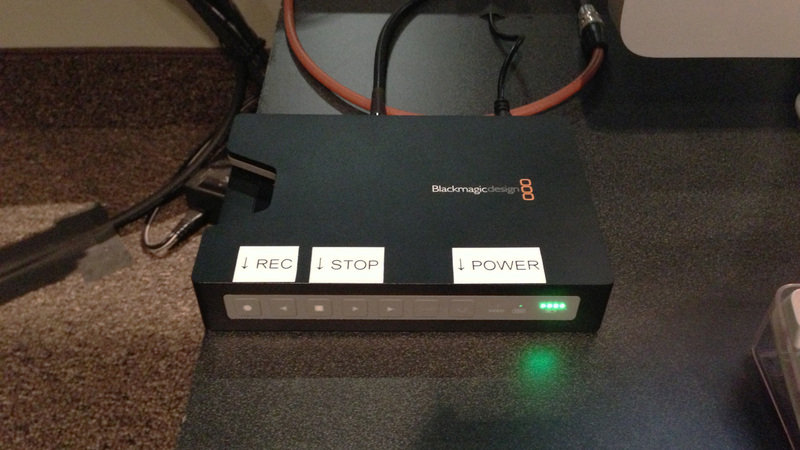 Unplug the MSU SSD from the rack mounted Blackmagic Recorder. Look at the dry erase board at the top of the stairs. A service time should be circled. Write that time down on a sticky note and stick it to the SSD drive. 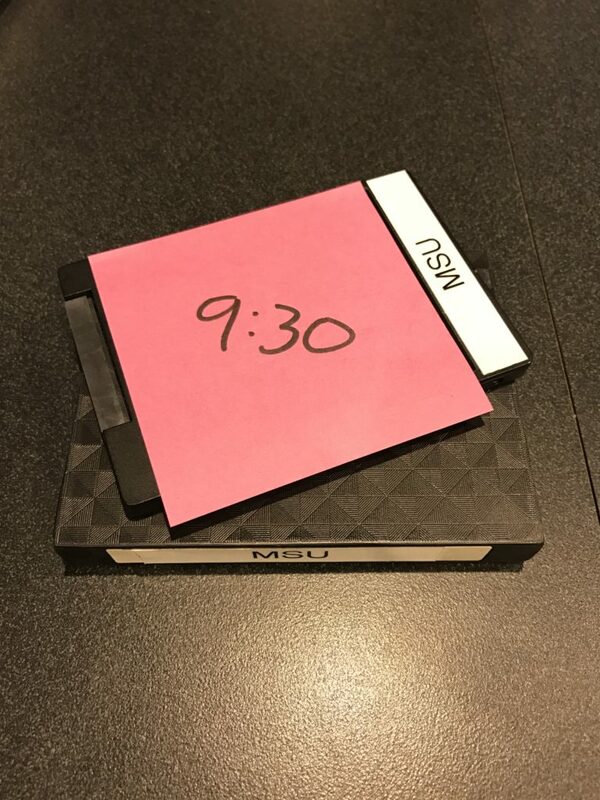 Place the drive with sticky note in the MSU SSD case. 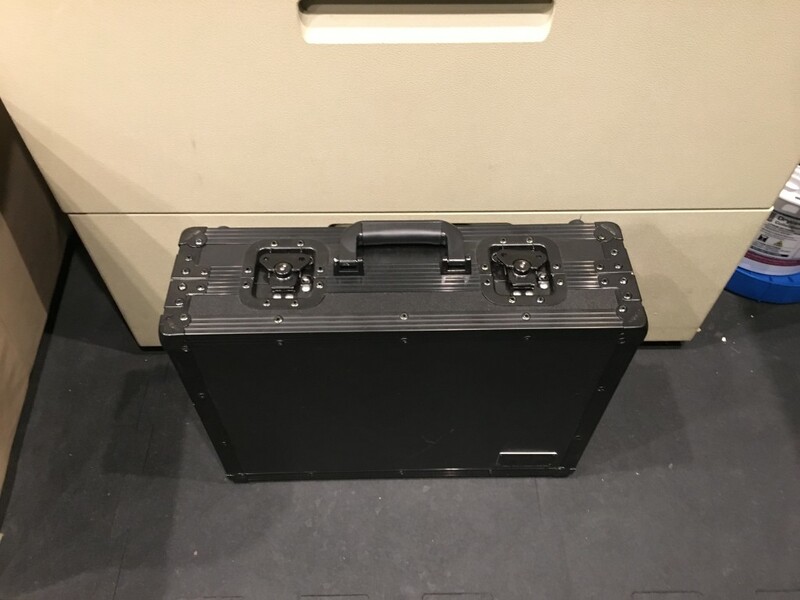 Take the SSD case and place it in the MSU bin next to the couch in the AV Booth. 6. Put the MSU MacBook in the laptop case located in front of the file cabinet. Press down on the lid to secure butterfly latches. 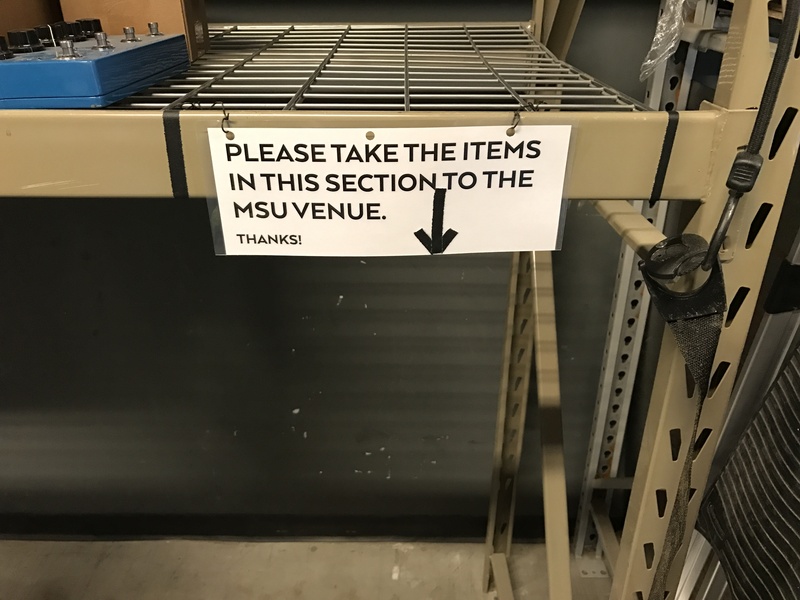 Take the laptop case and the MSU Bin and place them on the floor under the MSU equipment rack backstage to be transported to MSU. That is everything that the MSU venue needs for video teaching. Thank you for your weekend of service! Double check that the cameras and screens are off, and you’re done. We’re now adding a few post service procedures for camera on Saturday night. These steps will make sure that the recorded message from Saturday makes it to our venues on Sunday morning. Here’s the simple steps to make that possible. 1. 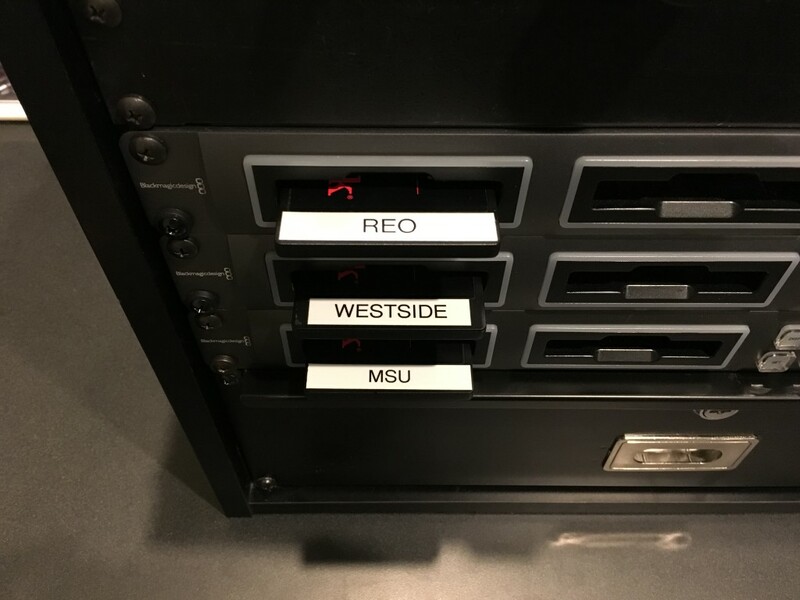 Unplug only the REO SSD, WSV SSD, and LCCC SSD from the rack mounted Blackmagic Recorders and put them in the REO, WSV, and LCCC SSD cases. 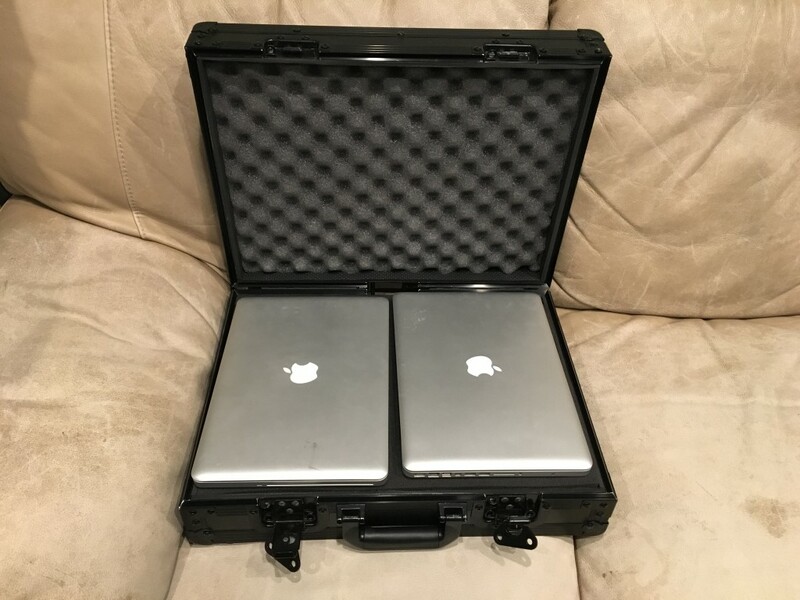 Take the SSD cases and place them in the REO and WSV bins next to the couch in the AV Booth. Leave the LCCC SSD on the counter next to the iMac computers. 2. 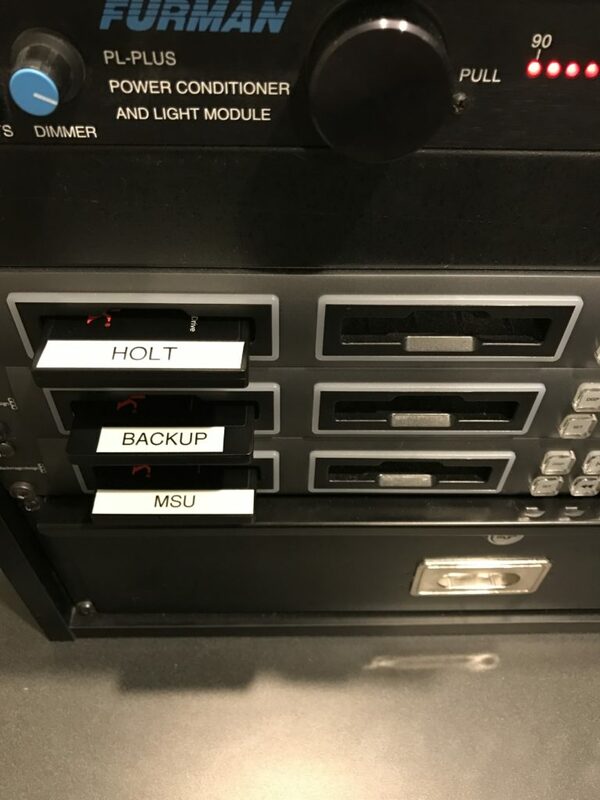 Remove the Holt SSD from its case and insert it into the left dock of the top rack mounted Blackmagic Recorder. Remove the Backup SSD from its case and insert it into the left dock of the 2nd rack mounted Blackmagic Recorder. The docks will briefly glow green when the drives have been properly inserted. That is it, the video is ready to be transported to our venues for Sunday morning. For MSU venue recorded message, see the Camera Post Service Sunday document. With the addition of our 3rd venue, we’re switched to using the iMac to capture from Sony lock down camera instead of the JVC IMAG camera. There is a new capture software that accompanies this switch. 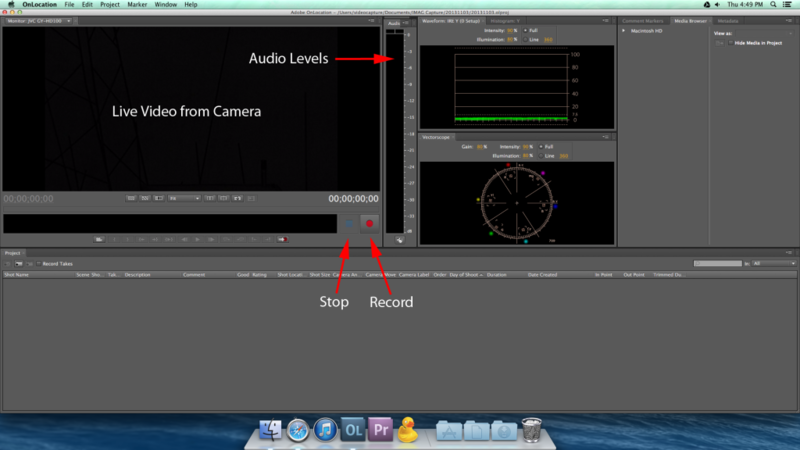 This does NOT replace the recording on the Blackmagic SSD decks, so please continue to do that as well. Click the “Log and Capture” tab at the bottom of the preview window. Click the “Capture” button during the last song before the message. After the prayer at the end of the message, Click the “Capture” button to stop recording. The program automatically saves the recording, so there is no save option. That’s all for the iMac recording now. 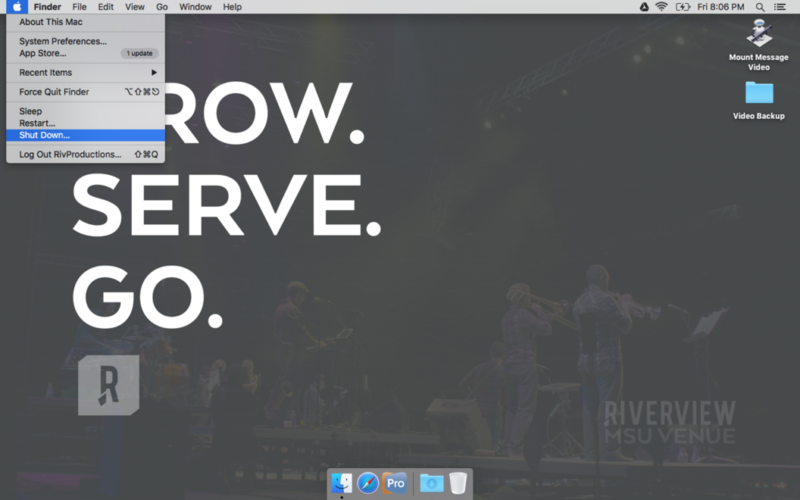 If you have any questions, please contact Josh.Nunn@RivChurch.com. With the recent release of OS X 10.9 Mavericks, we have upgraded most of our production computers from Snow Leopard to the latest Apple operating system. In the process of this upgrade however, we lost the old iMovie, and this new one just isn’t going to work for recording the IMAG camera anymore. So there’s a new program called OnLocation that we will be using instead. This does not replace our recording on the BlackMagic SSD, so please continue to do that as well. At the end of the day quit OnLocation. 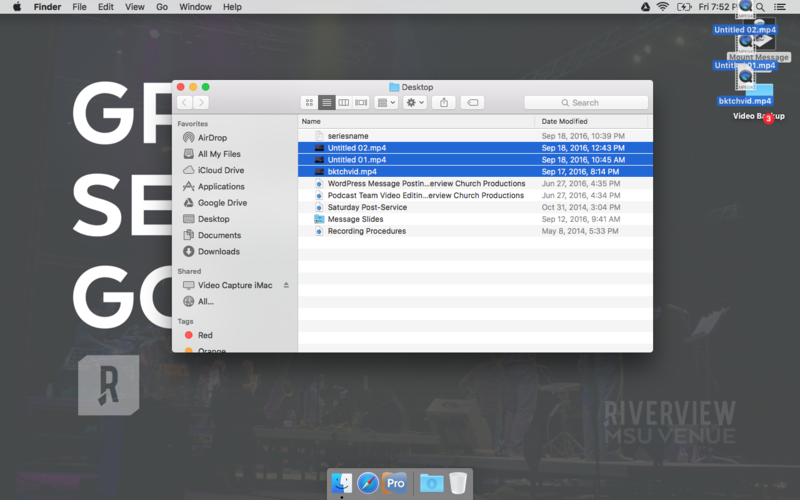 The program automatically saves the recordings, so there is no save option. Finding the correct focus and framing for the sony lock-down shot can be a bit of a trick. These things should not change from week to week, but if you do need to reset the zoom and focus on this camera, here’s some tips that will help you get the perfect setup. Start by zooming in all the way on the teacher while they are on stage. Carefully adjust the focus ring until the lines on the speaker’s shirt “pop out” or you can clearly read their coffee mug or edge of their bible. 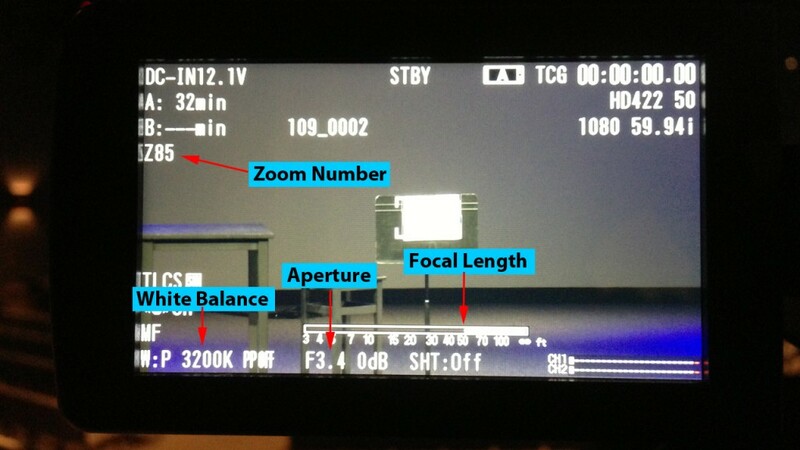 Check your focus by looking at the focus graph on the bottom center of the sony camera display. The left side of the focus bar should be above the “0” of the 50′ mark. Once you have set your focus, zoom back out to get the whole speaking area in frame. On the left side of the camera display there is a zoom number. That number should be at 85 when you’ve reached the correct zoom. As some of you have already seen, we have recently replaced the little Canon camera with a new Sony camera. This move has greatly increased the video quality of our messages which are used for the website, MSU, and soon the REO venue. Here’s some things you need to know about the new camera. This new camera is all setup and ready to go. You just need to turn it on, and open the lens cap. The power button slides left and right on the back of the camera, the lens cap slides up and down on the front left to open and close. You should check framing and focus just like before, but these things should be all set. 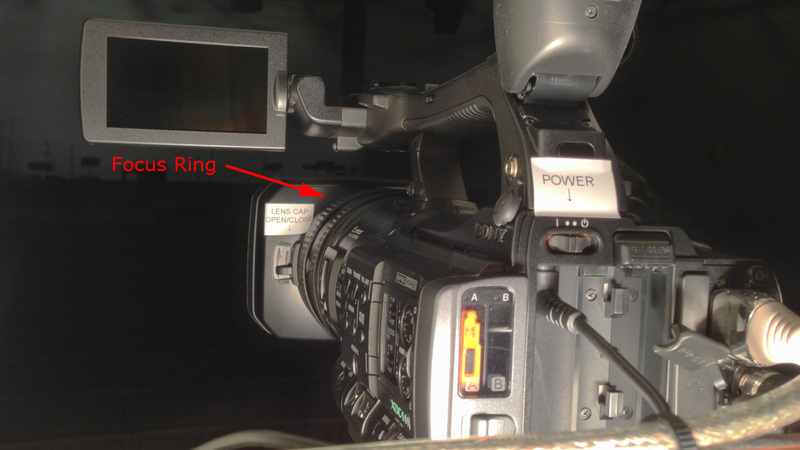 To check those, press the “HDMI” button on the monitor above the JVC camera. It might take a second before video displays. If after a second or two if the screen is still black, double check that you opened the lens cap. (See attached picture) To switch back to the IMAG camera, press the “YPbPr” button on the IKAN monitor. Recording is a little different with this new camera. Instead of recording to the camera, video will be recorded on a separate SSD recorder. This recorder is located to the left of the iMac. You will need to turn this recorder on by pressing the power button and hitting the record button at least a song or two before the message. (Buttons glow when active) When the message is done, hit the stop button. At the end of the day, hold the power button for the recorder to turn off. 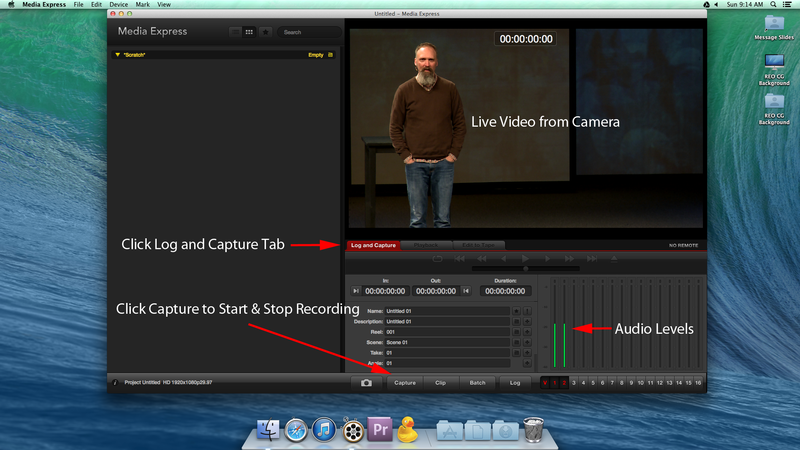 Recording on the iMac with iMovie will stay the same, so please continue to do that as well. An updated checklist is available here and is also posted next to the camera platform.